After all the sweetness, caramel, sugar and desserts I had to take a break and show you I don't live on desserts only. Strange, isn't it? Not that I couldn't, but at least a little savoury appetizer just before that, huh? There are days when I could live on appetizers and desserts only. No kidding. The only one kidding around here is the weather. Monday and Tuesday I was thinking I needed to search my wardrobe for a lighter jacket, it was getting really warm, blazing sun (I can't even remember where my sunglasses are, it's been so long since I saw some strong sunshine). And then... Wednesday morning, not only there was no sun in sight, there was nothing in sight, all covered by fog. And, as you know, the only healthy antidepressive medicine in this case is to turn the oven on and bake something fragrant. Don't you agree? These really take minutes to prepare and bake. But they will calm down your hunger while waiting for dinner to be ready. They're soft and taste and smell like lemons. Oh, so good. and bring them together stirring with a wooden spoon or spatula, forming rather soft dough. With wet hands, for little balls (tablespoon size) and place them on a baking sheet lined with baking paper. Drizzle a little Extra virgin olive oil over them (or even better, brush with oil) and bake for about 15 minutes. Flip them after 10 minutes . Serve them as an appetizer, I made something I love very much to go with these: Grilled Red Radicchio, Belgian endive and toasted pancetta, seasoned with EVOO and Balsamic vinegar. Bitter and sweet combination of the two was amazingly good. Che morbidezza, e che sapore dolce, profumo di limone… Vi va un antipastino? Vi suggerisco di provarle assolutamente con il radicchio rosso grigliato e mischiato con l’insalata belga e la pancetta tostata, conditi con l’olio EVO e l’aceto balsamico. Si sposano a meraviglia. Dolce e amaro. Mettete tutti gli ingredienti in una ciotola: i formaggi, il tuorlo, la farina, la scorza grattugiata di un limone e il prezzemolo tritato, e mescolate tutto con un cucchiaio di legno per formare una pasta morbida. Con le mani inumidite formate delle palline grandi come le noci e distribuitele su una placca da forno rivestita da carta da forno. Spruzzate con un po’ di olio EVO e cuocete nel forno caldo per circa 15 minuti. Giratele dopo 10 minuti perche altrimenti si bruciano sotto. Servitele calde, ma se vi avanza qualcuna, non butatela, sono buone anche fredde. Nakon svih slatkih recepata koje sam vam servirala u zadnje vrijeme, morala sam izaći iz šećerne kome i vratiti se malo pravoj hrani. Za početak evo jednog brzog i ukusnog, mirisnog prijedloga za predjelo. Pomiješajte u zdjeli svježi sir, ribani sir, žumanjak, brašno, naribanu koricu limuna i sitno nasjeckan list peršuna da dobijete glatku smjesu. Posolite po ukusu. Vlažnim rukama oblikujte kuglice veličine oraha i slažite ih na pleh obložen papirom za pečenje. Pospite ih s malo ulja i pecite oko 15 minuta na 200°C. Ja sam ih nakon 10 minuta okrenula jer su mi se ispod jače zapekle, a gore su ostale bijele. la famigia in questo periodo si è fissata con le polpette di ricotta nel sugo. Ora non posso non provare queste! 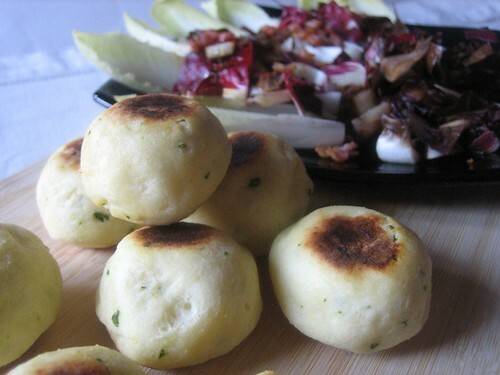 The ricotte bread rolls would go really well with some vegetable soup! ma sono proprio simpatiche!! le segno da provare!! Zanimljive polpetice, jednostavne i brze za pripremiti! Lovely little rolls, I bet they're wicked good. belle belle queste polpette, mi piacciono! copio e le proverò! Just Splendidly delicious looking... YUM!! What delicious little gems these are! And so easy to make. Baking is the best comfort for bad weather. Super novi izgled bloga!!! Recept je jedan od mojih omiljenih (slicno kao scones)! Da je extra recept jeste...:)Radim ga brzinom svetlosti...njami! These polpette look so yummy. I am so glad you can bake them! Frying is too much for me most days! Hello there again, I made your recipe and like all cooks, I adapted it a bit, lol... Something about us cooks isn't it, we just can't resist. I used the gluten free flour and after making them into balls I made a little dent in each one and put in shredded mozzarella cheese. After I brushed on the olive oil, I sprinkled a little bit of Parmesan cheese on top. They turned out very, very, yummy! Very nice and brown on each side, with a little crunch. THANK YOU! I can't wait to try something else from your blog. Thank you, Cindy Sue. I'm so glad they turned out just like you wanted them, I'll try what you did next time, must be even more delicious. Stuff it, roll it and enjoy! What cereal are you having today? Basta! It's time for some pasta! Grab your fork, the crostata's served!